Wasn’t that long ago when all the racing we got to watch was on VHS that a dude with a Satellite recorded from Europe. Those tapes got passed around, grabbed out of trunks, and whisked home like contraband. Now it’s with a live stream, Twitter, and blogs. We’re following along with a Eurosport feed, and the RVV + Flanders hashtag on Twitter, Instagram, and Tumblr. There’s more marketing and excitement than usual, on the occasion of the 100th anniversary of Flanders. Also the post-Lance era mood in the industry. 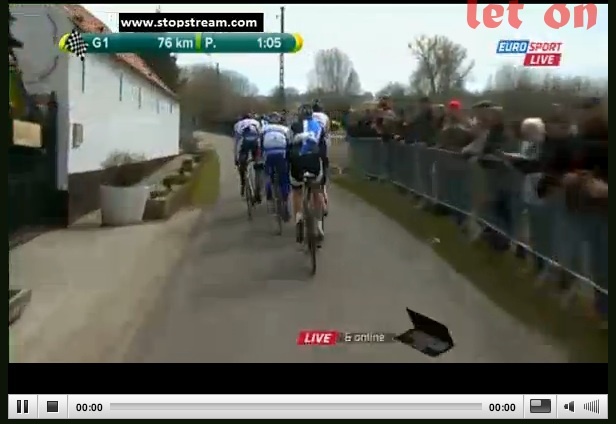 Bummer too that when we tune in, Boonen is down and out. Cyclocosm’s play by play on Twitter. And to watch it too visit Cyclingfans or Steephill and pick a stream. Pro tip: ignore the install flash ads and click the little X when they pop up. It’ll show up a few seconds later. You wouldn’t see the stream at all, if you didn’t have flash.